﻿ Make Earth Day Every Day at Your Business: 5 Tips for a Greener Office » Red Mango Marketing! Earth Day is a great annual reminder of how we can all live more sustainably throughout the year. For many small businesses and nonprofits, going green might feel daunting and costly — but who says that having a sustainability platform should be reserved to only larger corporations? Being a good corporate citizen is really important to us, and we here at Constant Contact believe that every small business has the power to make easy everyday choices to be more sustainable. To get you started, we reached out to a few members of our employee-led Green Team to provide some of their favorite green tips for small businesses and nonprofits. Read through these tips and share your own advice for running a green business. Let’s be honest, how often do we need one more bag cluttering up space under our kitchen sink? Over the past few years, customers have become increasingly understanding (and appreciative) of stores that encourage folks to bring their own bags. Not only is it an easy way to be green, but it’ll save your business money not having to buy as many disposable shopping bags. Sometimes the best way to go green is to simply learn by doing. Our employees regularly volunteer at local farms (including one of our local customers: Waltham Fields Community Farm) and they always come back with great advice on organic farming, locally-sourced foods, and living more sustainably. Chances are your town or city has a community garden with members that are more than willing to share their expertise. Let There Be (Energy Efficient) Light! John should know a thing or two about lightbulbs. He and his team have worked hard to shrink our footprint in all of our offices. From motion-sensing, energy-efficient lights to low-flow plumbing, we’ve made our office space more sustainable because it is good for the earth and good for our bottom line. Changing a few lightbulbs and turning off electronics before leaving each night are easy steps that can go a long way, and even allow you to reinvest some money back into your business. And finally, I love walking into a small business and seeing a Constant Contact newsletter signup sheet at the counter — not just because I love our customers (we all do… we’re kind of obsessed), but also because it means you’re likely not sending paper mailings to your customers. It might seem like a small thing, but replacing paper mailings with email newsletters saves trees and prevents a lot of waste. You can find more tips on becoming a paperless business here. Make Earth Day every day at your office. Earth Day will come and go, but all of the above suggestions from our employees can be done every day of the year, and they’re all really quite easy to implement. So consider April 22 as a jumping-off point for your greener, leaner small business or nonprofit, and use the above tips to make every day of this year Earth Day. Have any green tips we didn’t cover? Let us know what we missed. 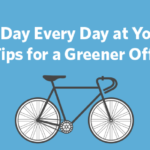 The post Make Earth Day Every Day at Your Business: 5 Tips for a Greener Office appeared first on Constant Contact Blogs. This entry was posted on Friday, April 22nd, 2016 at 7:00 am	and is filed under Business Tips, Fresh Insights, News & Updates, Small business tips. You can follow any responses to this entry through the RSS 2.0 feed. Both comments and pings are currently closed.